Control4 adds to the more than 8,000 devices it can automate with the newly announced Panasonic “Beyond Smart” 4K TVs, and makes them automation-ready for consumers’ smart homes with factory-enabled SDDP. Salt Lake City, UT — January 6, 2015— Control4 Corporation (NASDAQ: CTRL), a leading provider of home automation and control solutions, today announced that Panasonic is launching two new 4K Ultra HD TVs incorporating Control4® Simple Device Discovery Protocol (SDDP) technology, software to simplify integration with Control4 automation systems. This integration solidifies Panasonic’s dedication to “Beyond Smart” capabilities, and aligns these products with the needs of home automation-conscious consumers. With these new 4K Ultra HD Series TVs, Panasonic joins an industry-leading roster of over 100 manufacturers including Bose, Denon, DISH Network, Harmon, Integra, Marantz, Onkyo, Pioneer, Sony, TiVo, Toshiba, and Yamaha who are including Control4’s SDDP technology within their products and leveraging the Control4 platform to deliver smart-home experiences and solutions to consumers. 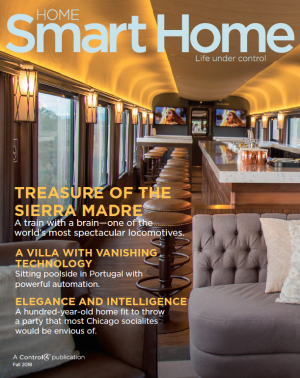 Control4’s SDDP continues to gain adoption by consumer product manufacturers entering the rapidly growing connected home market. With an SDDP-enabled device, a Control4 home automation system automatically finds, identifies, authenticates, adds and connects the device nearly instantaneously during the initial installation – reducing the complexity and configuration time for installers as well as reducing potential incompatibility with other devices within consumers’ homes. Control4 can seamlessly incorporate numerous network-aware household devices into a smart and connected home experience for family-rooms, home theaters, multi-room audio and video steaming, as well as whole-home intelligent lighting, climate control, and security system orchestration. Building on the already-robust list of industry leading manufacturers factory-enabling their products with SDDP, Control4 has added over 20 new SDDP partners since September 2014. In addition to Panasonic, these new licensing partners include: Bluesound – media streaming specialists, Rachio – premium smart irrigation control experts, and Denon’s HEOS – audio streaming solutions, as well as manufacturers of security locks, lighting devices and audio/video switches. Control4 intends to continue this momentum into 2015, as new products from established leaders and new entrants aim to stake their place in the connected home – all more achievable and powerful using Control4 SDDP technology. For more information, visit www.control4.com. Control4 [NASDAQ: CTRL] is a leading provider of automation systems for homes and businesses, offering personalized control of lighting, music, video, temperature, security, communications and similar functionalities into a unified home automation solution that enhances the daily lives of its customers. Control4 unlocks the potential of connected devices, making entertainment systems easier to use, homes more comfortable and energy efficient, and families more secure. More than 75% of Control4’s consumers have integrated two or more functionalities with Control4’s solution, which is available through more than 3,000 custom integrators, retail outlets, and distributors in over 80 countries. By delivering insightfully simple control solutions that enhance the lives of individuals and families, Control4 is the automation platform of choice for consumers, major consumer electronics companies, hotels, and businesses around the world. This press release contains “forward-looking statements” within the meaning of the “safe harbor” provisions of the Private Securities Litigation Reform Act of 1995, including but not limited to, statements regarding Control4’s possible future products and financial outlook. All statements other than statements of historical fact contained in this press release are forward-looking statements. These forward-looking statements are made as of the date they were first issued, and were based on the then-current expectations, estimates, forecasts, and projections, as well as the beliefs and assumptions of management. Forward-looking statements are subject to a number of risks and uncertainties, many of which involve factors or circumstances that are beyond Control4’s control. Control4’s actual results could differ materially from those stated or implied in forward-looking statements due to a number of factors, including but not limited to, risks detailed in Control4’s most recent Annual Report on Form 10-K and Quarterly Report on Form 10-Q filed with the Securities and Exchange Commission, as well as other documents that may be filed by the company from time to time with the Securities and Exchange Commission. Past performance is not necessarily indicative of future results. The forward-looking statements included in this press release represent Control4’s views as of the date of this press release. The company anticipates that subsequent events and developments may cause its views to change. Control4 has no intention and undertakes no obligation to update or revise any forward-looking statements, whether as a result of new information, future events, or otherwise. These forward-looking statements should not be relied upon as representing Control4’s views as of any date subsequent to the date of this press release.